If you are not able to use one of the existing SDKs you can also implement the functionality of the plenigo API by yourself. There are some additional things you have to implement besides the API to use the full feature set of plenigo. plenigo relies heavily on correct date times so make sure your servers time is up to date. Running NTP is strongly recommended. Every request to the plenigo API is protected by a so called “plenigo Token”. The plenigo token is a JWT with Hash Algorithm HS256. Use your plenigo merchant secret key as key for the hash function. Plenigo makes it simple to add a paywall to your system. First of all you have to enable the paywall. Therefore you have to login in the merchant backend with your credentials. Navigate to “Paywall” -> “Settings”. Here you must activate the paywall. Furthermore you can disable and enable the paywall with the timing. The encryption method used is AES/CTR/NoPadding 128 bit with the following initialization vector: 7a134cc376d05cf6bc116e1e53c8801e. The encrypted byte string is converted to a hexadecimal string. Key for encryption is a MD5 hash of the company id (not the company secret!) that can be retrieved from the company administration area. COMPANY_ID_MD5_VALUE The MD5 checksum of your company id. COOKIE_DATA Complete cookie data string. startWithFirstDay flag indicating if metered period starts with first visit or at first day / 0 o’clock, etc. It is possible to use your own registration and login process and only login users into plenigo via so called “Login Tokens”. * Registers a new user bound to the company that registers the user. * @return string Id of the created customer. * @throws PlenigoException In case of communication errors or invalid parameters. It is very important for the plenigo system to know the correct email address of the user. Otherwise invoices, etc. cannot sent to the user. If the user or one of your support agents changes the email of the user in your user management system you have to inform the plenigo system about the changes. To indicate a successful login to the plenigo system you need to create a so called “Login Token”. This login token is valid for 5 minutes and can be passed e.g. to the bulid()- method of the \plenigo\builders\CheckoutSnippetBuilder`. With this functionality the company can provide several access ids to a given customer. This is useful if the company has internal systems for billing, CRM, customer engagement, etc. With this data entered, you can use any of these Ids to check for access to products below. The secret (e.g. “RYsDfmNzTWcQiO8PpLtwzNP8LHsV154TngrY5SSvj”) and the company-ID (e.g. “51NuCmdDRTZZDkQqCqP2Q”) of the plenigo merchant backend. OAuth is an open standard for authorization. OAuth provides client applications a ‘secure delegated access’ to server resources on behalf of a resource owner. It specifies a process for resource owners to authorize third-party access to their server resources without sharing their credentials. Designed specifically to work with Hypertext Transfer Protocol (HTTP), OAuth essentially allows access tokens to be issued to third-party clients by an authorization server, with the approval of the resource owner, or end-user. The client then uses the access token to access the protected resources hosted by the resource server. 1.Authorization Request: A Client Application must first obtain authorization from the Resource Owner before it can access a protected resource. 2.Grant Request: The Client Application then exchanges the access grant for an access token. 3.Access Token: Lastly, the Client Application accesses the protected resource by presenting the access token to the resource server. In the following example we assume that a plenigo client called “Merchant” is using the plenigo OAuth 2.0 interfaces. To concentrate on the actual logic, there will be no concrete programming languages included. Please consult the SDK documentations for that case. A access token has only a limited lifetime, after that the plenigo server will response with a timeout message. Then the Merchant server has to request a new access token with the refresh token. If Merchant wants to access the plenigo API over a longer time period, e.g. 20 days without requesting a new login process for the user, it can save the refresh token to create new access tokens at anytime. Merchant now compares the customerId of plenigo with the ones he has within his user database and will not find it, because UserA was never there before. So Merchant creates a new customer profile for UserA with the data delivered by plenigo. Any old refresh tokens will be invalid from this point on. plenigo APIs use the OAuth 2.0 protocol for authentication and authorization. plenigo supports common OAuth 2.0 scenarios such as those for web server, installed, and client-side applications. Customers should protect the security of their end users by preventing request forgery attacks. The first step is creating a unique session token that holds state between the customers server and the end user’s client. 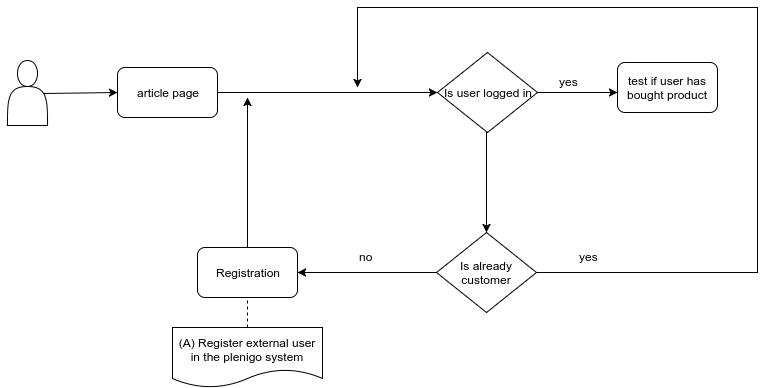 This unique session token is later matched with the authentication response returned by the plenigo OAuth Login service to verify that the user is making the request and not a malicious attacker. These tokens are often referred to as cross-site request forgery (CSRF) tokens. One good choice for a state token is a string of 30 or so characters constructed using a high-quality random-number generator. Another one is a hash generated by signing some of the session state variables with a key that is kept secret on the back-end. // Create a state token to prevent request forgery and store it in the session for later validation. # Create a state token to prevent request forgery and store it in the session for later validation. The three parameters to use can partially be filled automatically and some has to be offered by the customer. After the user finished the login process and accepts the company to be authorized to access his data, he will be redirected to the given target URL. In case of an error the given redirect URL is called with the following parameters. The possible values for error can be found in the OAuth 2.0 protocol specification. After the login process or checkout process including login finished the redirect URL will be called and look the following way. The first step depends if a CSRF token was provided or not. If yes the CSRF request token should be checked first. // Ensure that there is no request forgery going on, and that the user sending us this connect request is the user that was supposed to. # Ensure that the request is not a forgery and that the user sending this connect request is the expected user. Now the access token has to be obtained in exchange for the access code received after the login. To do so the a server side request to the plenigo server must be executed and call the following URL. The request is an HTTP POST request. In case of an error the the following parameters are returned. With the help of the refresh token received during the request of an access token a new access token can be requested if the current access token times out. To get a new access token the SDK has to make a server side request to the plenigo server and call the following URL. The request is a HTTP POST request. To verify if a user is logged in you need to read the cookie plenigo_user and sent it to the plenigo API getUserProfileBySessionCookie. To query if an user has bought a product, you must be logged in with plenigo, once you have done this you will have a cookie that contains encrypted data of the user, once you have this. The only thing you have to do is pass the product id and the cookie header to a service method, examples are provided below. For PHP you can use the \plenigo\services\UserService::hasBoughtProductWithProducts method for this purpose. “MY_PRODUCT_ID” can be an array of several IDs, then the method will return true if ANY of the provided products has been bought. This returns a boolean that will tell you if the user did buy the product(true) or not(false).This will return false too if the cookie has expired. This will return true always if the Paywall isn’t enabled, see below. For java you can use the com.plenigo.sdk.services.UserService#getProductsBought method for this purpose. This returns a com.plenigo.sdk.models.ProductsBought object with the required data. In order to get product information you need the product ID, you can get it in the product management area of the plenigo website, let’s say for example that your product id is QFURxFv0098893021041, below there are examples of how to get the information of this product. To get the information related to this product you can use the \plenigo\services\ProductService::getProductData method, which requires the product id and returns a \plenigo\models\ProductData object. In order to list all products for a company, you can call the product listing service. It will return a paginated list of products (id, name, description) and allows to query the page you request by using the size parameter and the last ID of the previous record set (optional). In order to get category information you need the category ID, you can get it in the category management area of the plenigo website, let’s say for example that your category id is QFURxFv0098893021041, below there are examples of how to get the information of this category. In order to list all categories for a company, you can call the category listing service. It will return a paginated list of categories (categorytId, name) and allows to query the page you request by using the size parameter and the last ID of the previous record set (optional). To get the information of the categories you can use the \plenigo\services\ProductService::getCategoryList method, which requires the page size and optional last id and returns a list as shown below. To get the information of the categories you can use the \plenigo\services\ProductService::getCategoryList method, which requires the page size and page number and returns an associative array as shown below. //            [title] => "General Goods"
This method allows to check if the entire paywall has been disabled from the Plenigo Administration Page. It allows to Quickly bring down all payments for a given Company and is useful for testing and development purposes. For PHP you can use the \plenigo\services\UserService::isPaywallEnabled() method for this purpose. This returns a boolean that will tell you if the paywall is enabled (true) or not (false). If the product is managed by the plenigo and was configured in the plenigo website, only the product id is required for checkout. By using the \plenigo\builders\CheckoutSnippetBuilder class, you can create snippets easily by filling out the \plenigo\models\ProductBase class with the required information. For these products, you have to specify more information such as tax, description, currency, etc. Below there are examples. // creating special product object for "Failed Payments"
The key to use for encryption is the MD5 hash of your company secret from the plenigo merchant backend. Create a HmacSHA256 checksum of the concatenated string and add it to the end of the string separated by a dot (.). The secret key to use is your company secret from the plenigo merchant backend. The encrypted payment data can include the following parameter. The mandatory parameters change if the plenigo is managed by the plenigo backend or if you create a product dynamically on the fly by every checkout. Non plenigo managed products can only be one time purchases. Subscriptions must be managed over the plenigo merchant backend. As a company if you want to give free access to customers you can generate a voucher campaign (by creating voucher Ids that can be redeemed as a free purchase of a product. Vouchers are numbered and limited in nature (up to 10 thousand per channel) but if you are looking for an unlimited free giveaway, you can create and allow purchase of a free (as in $0-. price) product. A voucher can be used to put a “tag” on a free product purchase. Also, if you only provide the purchase though Voucher Redemption, it means that when the voucher Ids are redeemed, then there is no more purchases left for the product. $productId yes string (default: 1, max: 10000) The amount of vouchers to generate for each channel, will always be 1 for SINGLE voucher types. $startDate no string The start date of the campaign in the following format: YYYY-MM-DD. $expirationDate no string The expiration date of the campaign in the following format: YYYY-MM-DD. $amount optional string (default: 1, max: 10000) The amount of vouchers to generate for each channel, will always be 1 for SINGLE voucher types. $customerId yes string The customer id you can get from the UserService::getCustomerInfo() method.